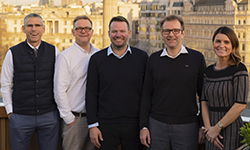 MMGY Global has acquired Digital Spring, a London-based content, media and creative solutions agency for travel and tourism brands. Digital Spring will be part of the company’s European integrated services brand, MMGY, working with sister U.K.-based brands Hills Balfour, Grifco and Ophir. (L-R): MMGY Global CEO Clayton Reid with Digital Spring co-founder and operations director Rob Llewellyn, Digital Spring directors Rob Jolliffe and Dominique Moseley, and MMGY Global president Katie Briscoe. Agency founders Rob Jolliffe, Rob Llewellyn and Dominique Moseley will remain part of the business. MMGY says that the acquisition will allow it to provide its clients full media services across both digital and traditional channels as part of its European offering. It will now also offer a suite of proprietary media products geared toward specific U.K. and European travelers. “This expansion of our MMGY platform in the U.K., alongside our Grifco, Ophir and Hills Balfour operations, is part of our belief that travel on the Continent is growing and important,” said MMGU Global CEO Clayton Reid. Digital Spring is the sixth acquisition by MMGY Global since private equity firm Peninsula Capital Partners made a significant equity investment in the company in 2016. In addition to Hills Balfour, Grifco and Ophir, prior acquisitions included DK Shifflet & Associates, Myriad Marketing and Nancy J. Friedman Public Relations.